The moment I saw the picture of the strawberry strudel in the Billboard, I was put on a trance. 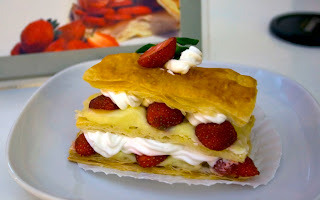 For a mere 6RM, you could actually taste a piece of heaven in three layers of flaky pastry with cream and fresh strawberries inside. YUMMY. The restaurant was called Strawberry Moments located at the center of Brinchang town in Cameron Highlands. From the name itself everything on the menu was strawberry based. My travel buddies (Jay and Tina with the new addition Reg) and I went to spend the night in Cameron Highlands last May 24. We took a a tour package we picked out over the internet (Naging BFFs kami ni Mr. Tan at Mr. Thiru) and endured a 5 hour trip (one way) to eat the freshest strawberries and vegetables in Malaysia (not to mention see the biggest Tea Plantation in Southeast Asia). The place was perfectly cool (19degrees) during the daytime that you won't even feel the sun's hot rays. We stayed at a hotel called Irish House. It was nice and clean and spacious enough to fit all four of us in one big room. It was also fairly close to the town centre so we could just walk around town free and easy. We enjoyed the pasar malam where we shopped and ate till we drop. I tasted the sweetest corn in the world(I call it the two toned corn) and tried the weird looking but yummy deep fried mushrooms. Our package included a tour of the city so we visited Cameron's famous sights-- The BOH tea estate, the butterfly park, the honey bee farm, the market square, the rose and orchid garden, the strawberry farm, and the chinese temple. It was hectic and tiring but the sites were magnificent. Going back we endured another 5 hour bus ride (with a bunch of noisy girls who wouldnt stop talking and some "smelly passengers" to add flavor to the ride! hehehe). Reg downed two tablets of dramamine while I drowned myself with the songs saved in my ipod. It was a fun filled trip. Another successful adventure from the travel buddies of KL.